Suggested Uses: Beach accounts, amusement parks, schools, convenience stores, coffee shops, etc. 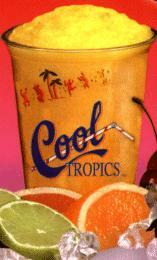 Tropical Paradise, Inc., 10 Trade Zone Drive, Ronkonkoma, NY 11779. Tel: 631-585-0986; Fax: 631-585-0988.